Whenever we experience any type of loss we go through the ‘five stages of grief’ or pattern of adjustment as originally designed in the grief cycle model by Elisabeth Kübler-Ross, Hospice pioneer and author of book On Death and Dying. This model is also known as ‘five stages of loss’. As a Hospice trained Caregiver, and Trauma Counsellor this model has formed a vital foundation for my work, and its helped my clients gain a far better understanding of what they’re unwittingly experiencing. Please feel free to share this page with your loved ones so they too can benefit, and should they need assistance, feel free to reach out. Originally this model was intended to describe the process a patient goes through when informed of a terminal illness. But, although this model is largely applicable to death, dying or terminal illness it can also be applied to different emotional traumas for example, relationship break up, a crime (hijacking or abuse), retrenchment, an accident or the more mundane loss of a set of keys or cell phone etc. As you read through the five stages, you’ll probably become aware and recognise how these steps can be applicable to your individual circumstances. The model was designed to help people understand what is happening so that dealing with their loss can be a little easier. 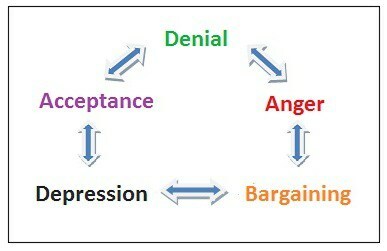 The five stages of loss or grief are: denial, anger, bargaining, depression and acceptance. These stages are not linear nor are they equal in experience. People tend to go through most of these, although not always in sequence and some stages might be revisited. The transition between stages should actually be seen as more of an ebb and flow than a rigid or linear progression. This is the “I feel fine!” or “This cannot be happening; not to me!” stage. The experience results in shock, disbelief and or confusion: you cannot believe what has happened. Denial is usually only a temporary defence mechanism and is a perfectly natural reaction as the body protects you against your feelings. Denial is a conscious or subconscious refusal to accept facts or the reality of the situation and this leaves one feeling powerless, frozen or numb. These feelings are often replaced with a heightened awareness or situations. This is the “Why Me?”, “Who is to blame?” or “This is not fair!” stage. You could be angry at yourself and or with others, especially those close to you. Your anger could also be because of a wrong decision, loosing control, the doctors, life, family, society or even God. This may also present as rage, resentment, irritation or snappiness. At times envy or jealousy may become prevalent because this happened to you and not someone else. We use anger when we hurt inside, and fear getting more hurt, so we hold people away from us. When angry we feel out of control within, and therefore try controlling everyone around us. Knowing or having an understanding of this is helpful to others (friends, family or colleagues) to be patient and understanding when a grieving person lashes out in anger. This is the “Yes, but …” or “If only, …” stage. This stage involves the hope that the individual can somehow postpone or delay death, and this may include bargaining with life or whatever God the person believes in i.e. “I’ll promise I’ll be a better person if …” or “Please just let me live until ….” Bargaining is to find meaning to what’s happening or to justify and become part of the process. You may feel it’s necessary to gain a second opinion, or try a new diet or want to dedicate your life to God in exchange for a reformed lifestyle. In other words, you’ll try other methods of coping. People facing trauma in a relationship break-up might ask for friendship in the bargaining phase. In one’s search for hope and meaning this is a wonderful and creative stage. Hope is reliance on the future that protects us from the ‘now’ which is too painful. This is the “I’m so sad, why bother with anything?” or “I’m going to die … what’s the point?” stage. The emotions in this stage vary from person to person and could involve sadness, regret, guilt, fear, numbness, fatigue, feeling alone, trapped, exposed or naked. If facing death, this shows the person has at least begun to accept facing the reality which may mean that death is certain. This is normal and should not be feared: this is where the emotional work gets done. The person may become silent, refuse visitors and spend much of their time alone crying and grieving. This process allows the dying person to disconnect themselves from things or people of love and affection. This is the “It’s going to be OK”, “I am ready, I don’t want to struggle any more” or “I can’t fight it, I may as well prepare for it” stage. Some emotional detachment and objectivity begins to surface, and this is where we can see the gift of the experience. This final stage comes with peace and understanding, death is approaching. Generally, the person in this stage may want to be left alone. Also, feelings and physical pain may be non-existent and people dying can enter this stage for a long time. This stage has also been described as the end of the dying struggle. 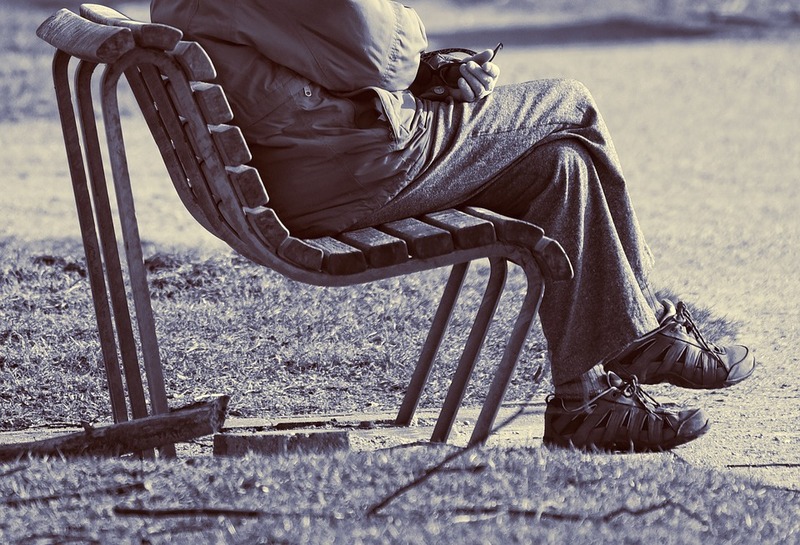 For those grieving the loss of a loved one, this can be the time where they being to re-enter a more ‘normal’ social life and are ready to start moving forwards. Using powerful body centered, and holistic techniques such as Emotional Freedom Techniques (EFT) or ‘tapping’ assists people facing any emotionally devastating loss to release these raw, painful or unpleasant emotions naturally and spontaneously. As the name Emotional Freedom Techniques implies, freedom is gained … freedom from discomfort, pain, suffering and loss etc. Emotional Freedom Techniques (EFT) or ‘tapping’ is innate in our body’s healing system – it’s something we do quite unconsciously virtually every day of our lives! To gain a better understanding of this, see How EFT works. Working together with a facilitator such as myself, should be seen as a co-operative journey to self discovery; where your real magnificence lies.